Friday, June 8, 2018, was already an exciting day for College of Charleston sophomore Katie Stagliano as she celebrated the 10 year anniversary of the start of her nonprofit organization, Katie’s Krops, at Tricounty Family Ministries in North Charleston, South Carolina. What she didn’t know was that this would also be the day that she would be named the grand prize winner of the Feeding Better Futures General Mills Scholars Program, an honor that comes with $50,000 to advance her mission. Katie Stagliano and her brother cut cabbages grown through her organization Katie’s Krops. An unsuspecting Stagliano helped cut the cabbages she brought as people gathered for the ministries’ weekly feeding program. The location of the announcement was fitting because it was where Stagliano, who is from Summerville, South Carolina, got her start in 2008 when she donated a 40-pound cabbage. That same year, at the age of nine, Stagliano founded Katie’s Krops, a nonprofit aimed at empowering children ages 9-16 to create vegetable gardens and donate the harvests of fresh produce to people in need. Today there are 100 Katie’s Krops gardens growing across the United States. RELATED: Learn more about how Katie’s Krops got started. In a video message, Jeff Harmening, chairman and CEO of General Mills, announced Stagliano as the recipient of the Feeding Better Futures grand prize, saying the company admired her for how she has served her community. A tearful Stagliano, who is a communication major, was completely surprised by the recognition. “I never in a million years thought this would happen… I’m over the moon right now,” she said. Rob Litt, director of corporate communications for General Mills, presented Stagliano with a $50,000 check. As the grand prize winner, she will also attend the Aspen Ideas Festival starting June 21, 2018, where she will make a presentation on Katie’s Krops. 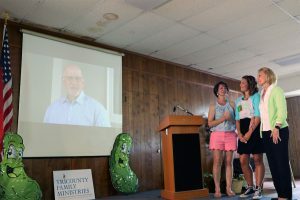 Katie Stagliano (center) listens with her mother, Stacey Stagliano, and Sue Hanshaw with Tricounty Family Ministries to a video message from General Mills Chairman Jeff Harmening. Her intent fits perfectly with the goal of the Feeding Better Futures Scholar Program, which launched this year with the goal of supporting students ages 13-21 engaged in activities to help end hunger or promote sustainable agriculture. Family and friends congratulated Stagliano with hugs and cheers. And some of the clients from the Tricounty Family Ministries, who have benefitted from her contributions, personally thanked Stagliano. 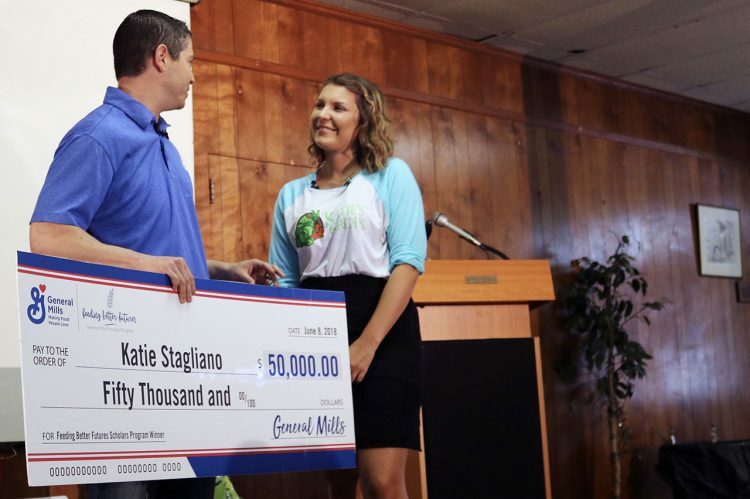 “The best part of today is thinking about everything that’s happened so far with Katie’s Krops, and now, because of General Mills, all the possibilities that can happen in the future” said Stagliano.